PlacementWorks is moving and upgrading their offices. “We will offer the same great services from improved facilities just a short drive from our current offices,” says Christy Brown, President of PlacementWorks. 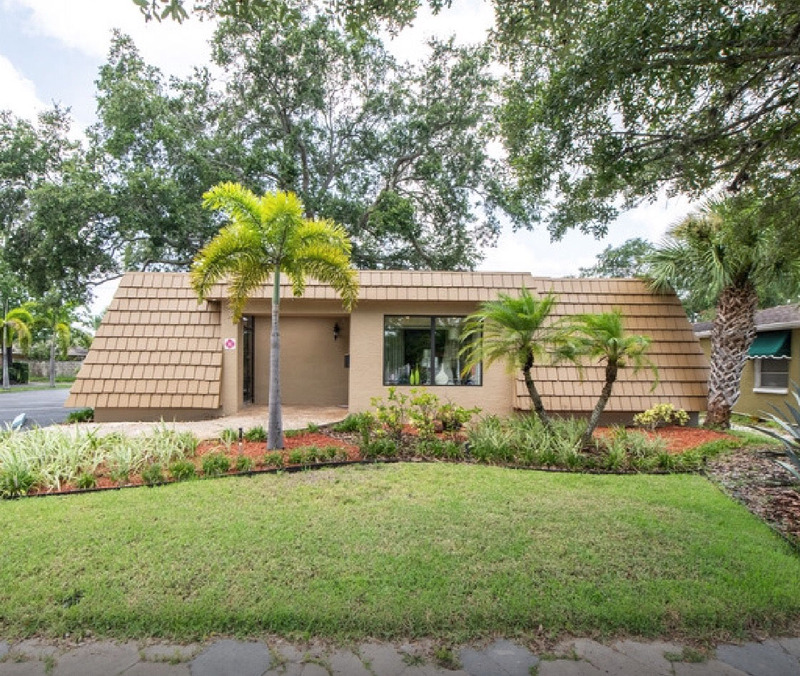 The new location is at: 4422 Central Avenue, Saint Petersburg, 33711. 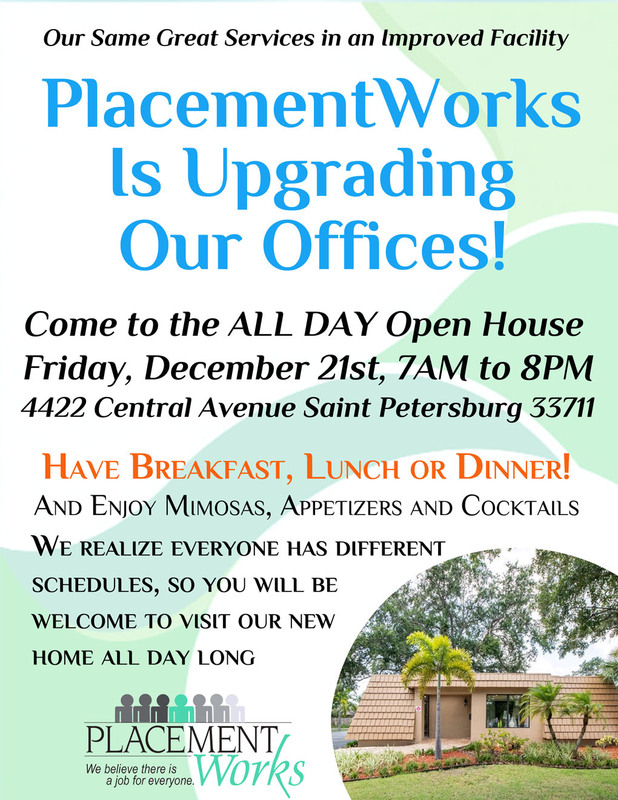 PlacementWorks is hosting an all-day open house event on Friday, December 21st, from 7Am to 8PM. As people who place folks in all types of jobs and in all types of shifts, we know that everyone has different schedules. So, we are having an all-day event, so you can come in and get breakfast and coffee at 7AM, or come in for lunch, or stop in later for dinner and drinks,” says Mona Andrews, Director of Employment Services at PlacmentWorks. “Working is what works! People with disabilities get better more quickly when engaged in purposeful activity. As a licensed mental health counselor, that realization inspired me to found the non-profit PlacementWorks. Since then, we have placed thousands of people with disabilities in jobs in the Tampa Bay area,” says Ms. Brown. Ms. Brown’s passion is providing services and supports specific to each person with a disability to promote employment success. She is an advocate and educator to employers with a focus on Abilities, not the disability of the person. She sees and knows the value in employers hiring persons with disabilities, thus the company motto: “We believe there is a job for everyone”. Hiring people with disabilities increases profit, lowers costs and improves employee morale and productivity. Not only has that been the experience of our clients’ employers, it is also nationally recognized. Studies by the U.S. Chamber of Commerce, the U.S. Department of Labor, DePaul University, and corporations including 3M, PepsiCo, Merck, and AT&T have borne this out. Also, 87% of the population prefers to do business with organizations that hire people with disabilities. Customers with disabilities and their families and friends represent a trillion-dollar market segment. When your employees mirror the market, you gain a lasting customer base. Finally, when an employer hires a person with a disability, they receive a wide variety of financial incentives, one of which is the Work Opportunity Tax Credit (WOTC). We partner with our employers, making sure our clients’ transition and training goes smoothly. Fewer than 25% of people with disabilities require special accommodations, and we facilitate that for you. Most accommodations are made with little or no cost - and may be paid for by Vocational Rehabilitation. Our employers frequently mention how easy and simple the placement process was for them. They express appreciation for the fact that we are available 24/7 and how we respond quickly and take immediate action. Christy Brown is the President/Director of PlacementWorks. She founded PlacementWorks in 2000 and partnered with the Department of Education, Division of Vocational Rehabilitation to provide services that would facilitate persons with disabilities to become successfully employed. 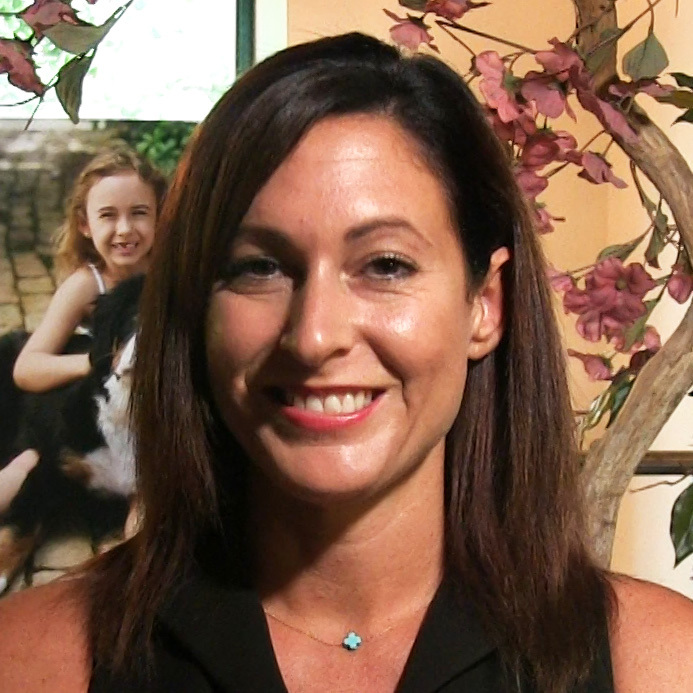 Christy is a Certified Rehabilitation Counselor; Certified Vocational Evaluator; Licensed Mental Health Counselor.